See above Bob (Robert) Weighton. I'm very proud that he is part of my 'Take a Look at Yourself' project. I photographed him about two months ago in Alton and received his portrait back with text last week. For this I owe a big thanks to Norma by the way. Norma had invited me to talk about my projects to a group of elderly ladies, plus Bob. During the break Bob sternly told me that I should speak much louder and clearer and be aware of my audience, who averaged around 80 years. Bob was also totally right I realised and I took his constructive criticism aboard well enough to earn a compliment from him after the second half of my talk. 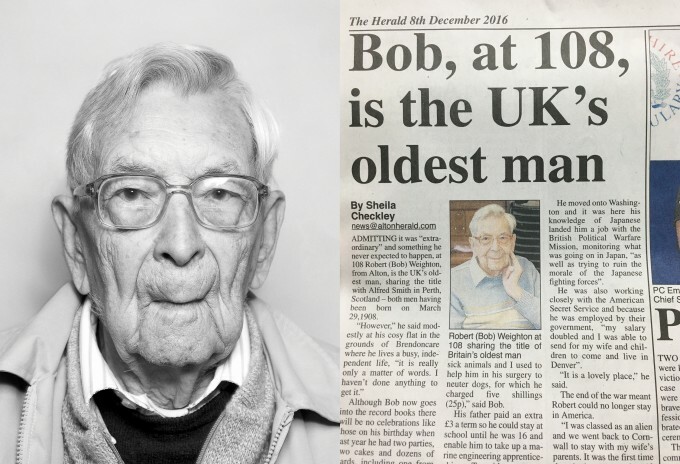 If I could only be as 'on it' as Bob in 69 years.